Miami garage floors, Fort Lauderdale garage floor coating, cabinets, organizers, and more from PremierGarage. Get the most advanced line of garage enhancement products on the market. From top-of-the-line wood, stainless steel, and metal finished cabinetry, to our signature PremierOne garage floor coating, we have the most unique and innovative products available to finish any home. With PremierGarage you’ll get everything you need to completely remodel your home garage. Choose home storage solutions and organizers that will add lasting beauty to you garage. And, clean-up your clutter and mess, for good! Our Hybrid Polymer PremierOne garage floor coating system is widely known in the industry as being superior to anything else. Even superior to epoxy coatings and do-it-yourself epoxy kits. See why PremierGarage of Miami – Ft. Lauderdale is the top garage enhancement expert in all of South Florida. Before PremierGarage of Miami-Ft. Lauderdale came onto the scene in Florida, there was little to no choice for getting high quality, long-lasting solutions with long-term benefits. Cheap epoxy based floor products are less durable and don’t withstand the test of time. Other products such as "rubber mats" and "interlocked tiles" are easily damaged and can accumulate liquid and dirt underneath the product. With PremierGarage, you’ll get flooring, garage cabinets, and organization products that are tested and guaranteed. It’s part of the PremierGuarantee. So your garage is a top priority for our Company. We are committed to our goal: 100% customer satisfaction. 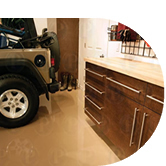 PremierGarage of Miami-Ft. Lauderdale is a proven name in the garage flooring industry. Enjoy products that are superior to anything else on the market. With our local service and experience, you can rest assured that your investment will be well worth the time and money. Learn how you can upgrade this space with our garage floor solutions, garage cabinets, and organization products. And schedule a complimentary design appointment today. From your initial design consultation with our staff, you will see how the product quality and presentation is unmatched. You will see a computer-aided design program that provides a realistic 3-D rendering of your enhanced garage layout—on the spot. We carefully coordinate all of your home's surroundings to ensure the color scheme and theme of your home is complemented by our work. Get a one-stop solution that’s durable, safe, and attractive. We offer the finest Miami garage flooring and Fort Lauderdale garage flooring, as well as top of the line cabinets that are available in wood, stainless steel and metal finishes. PremierGarage of Miami – Ft. Lauderdale is a member of the Better Business Bureau and the Builder’s Association of South Florida. What are some of the issues with cheaper do it yourself epoxy coatings? How do your garage floors compare head-to-head with epoxy? What type of garage cabinets can you install in Fort Lauderdale and Miami? Why is garage organization more important than ever before? How long have you been providing garage enhancement services in Miami and Fort Lauderdale Florida?